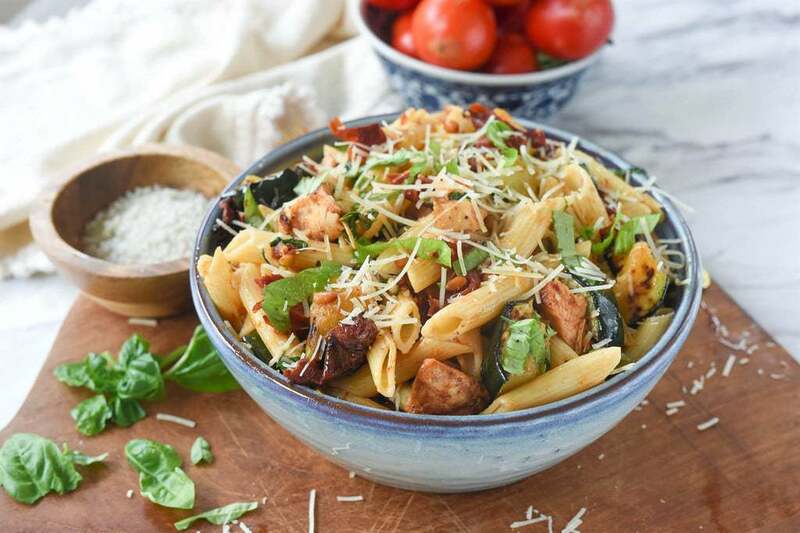 Garlic chicken pasta with roasted tomatoes comes together to make a flavorful and memorable dish. 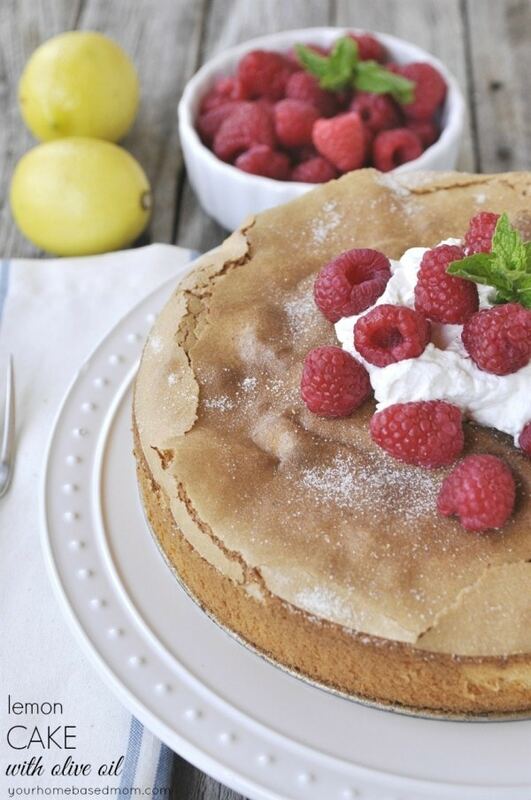 This will quickly become part of your dinner rotation. 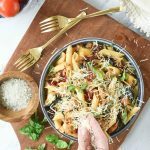 I love throwing my favorite ingredients together to make a delicious fresh pasta dish. That is how this garlic chicken pasta with roasted tomatoes came to be. I started with penne pasta, grilled chicken, and garlic. Then I added in some grilled zucchini, fresh basil, and parmesan cheese to the mix. And finished it off with the show stopper, roasted tomatoes. 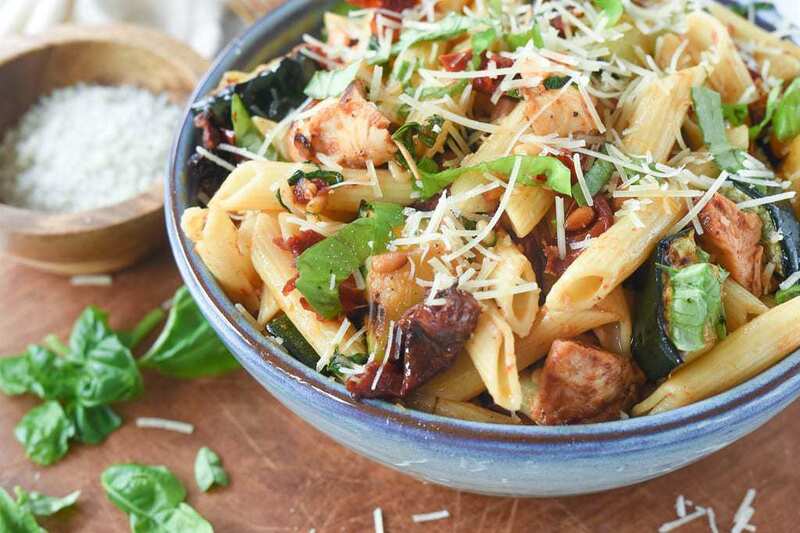 This pasta dish is so delicious. 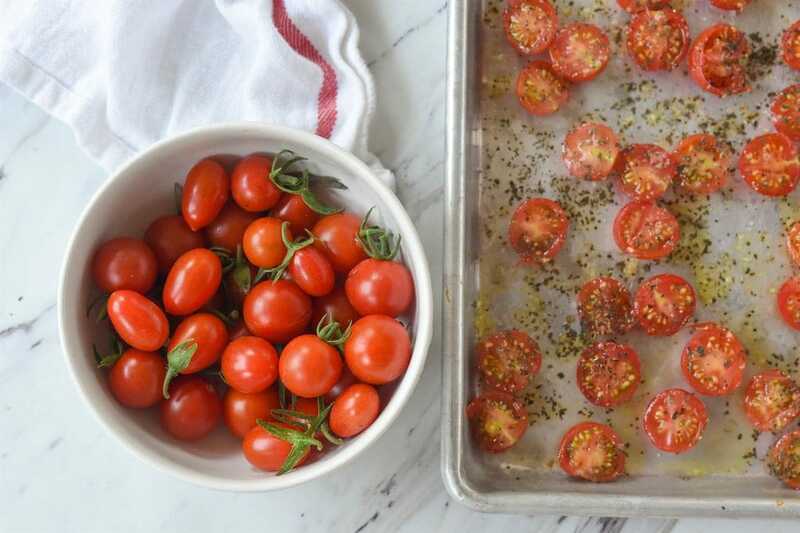 Roasting the tomatoes takes a little time and effort but it is so worth it. Trust me on this one. 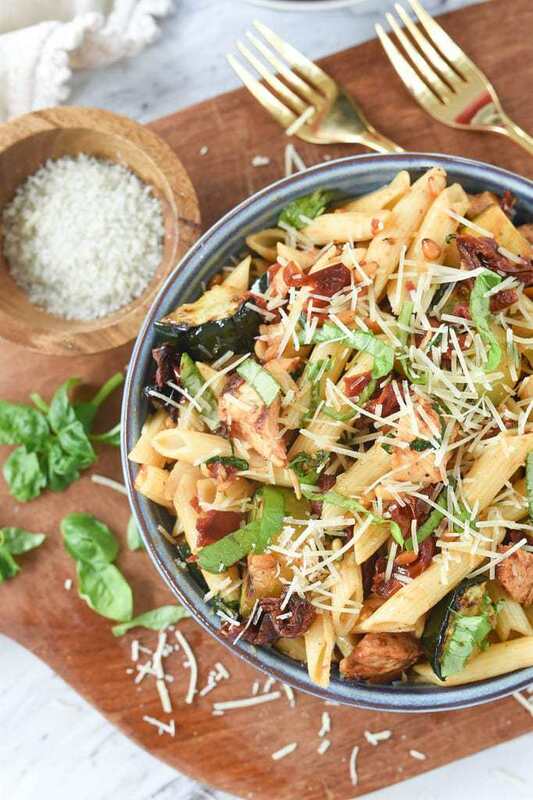 If you really don’t want to roast tomatoes, some fresh sliced cherry tomatoes added into the pasta would be delicious too or use jarred sun dried tomatoes you can purchase at the store. 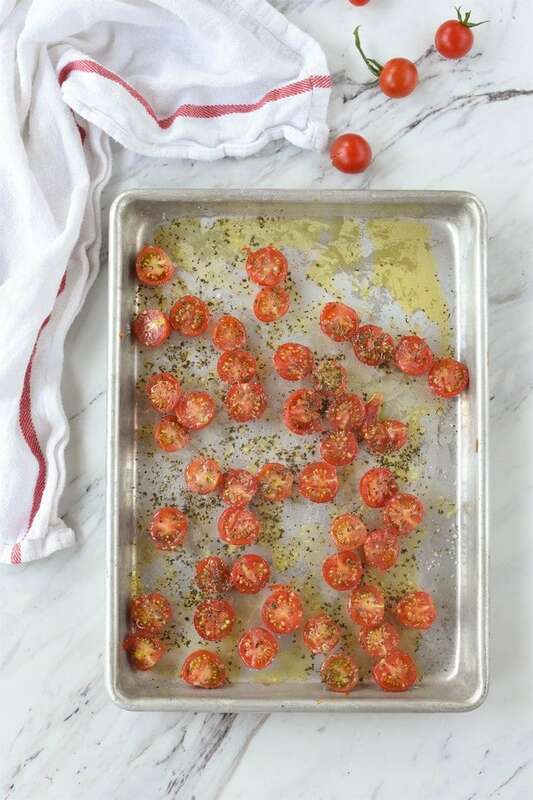 I like to call the roasted tomatoes tomato candy. The roasting makes them sweet and delicious! There is nothing quite like fresh tomatoes from my garden. My husband loves to just pop them right in his mouth but my favorite thing to do is roast them. 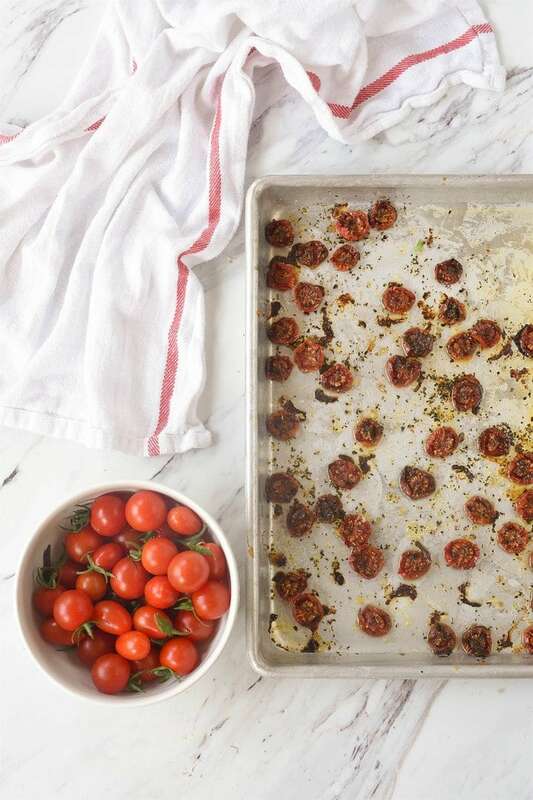 To roast a tomato just slice it in half and place it on a baking sheet, cut side up. Drizzle with some olive oil and then sprinkle with kosher salt, pepper and some dried basil (or fresh if you have it!) Then pop them in a 225 oven for about 3 hours. You don’t want them totally dried up – there should still be some moisture in them. They are great added into a salad, on pizza, or in soup. But I enjoy my roasted tomatoes best in pasta. Once the tomatoes are roasted, you are ready to make the garlic chicken pasta. To make the pasta, first, I marinaded chicken breasts in some olive oil, kosher salt and fresh lemon juice. I put them in the refrigerator for about an hour before we grilled it. Then I grilled a fresh zucchini. I just sliced it in half, drizzled it with a little olive oil and kosher salt and then grilled it until it softened up a bit. And, of course, got those nice grill marks. I put some olive oil in a large frying pan and browned the pine nuts. Then add in some garlic, the roasted tomatoes, sliced up chicken and zucchini, and added a little salt and some fresh basil. Just stir it all together until the flavors combined. Add in some cooked penne pasta and mix it all up. If it seems a little dry you can add in some more olive oil. And of course add salt and pepper to taste. Top it with a nice sprinkling of grated Parmesan cheese and fresh basil to finish it off and enjoy! 5 QT. NON STICK FRYING PAN – this is my go to frying pan. The one I use more than any other. I love that it has a lid. 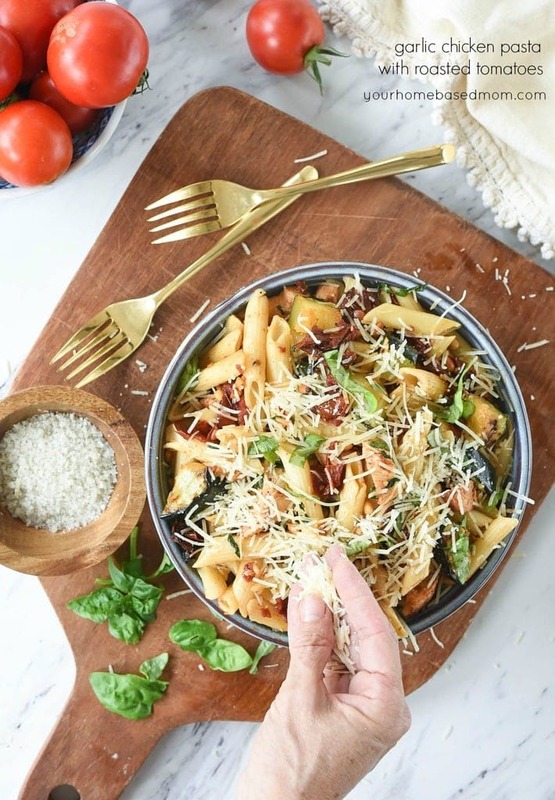 Delicious roasted tomatoes and garlic chicken pasta come together to make an unforgettable dish. Place in 225 degree oven for about 3 hours or until shriveled but should still have some moisture. Place chicken in bowl or plastic bag and cover with olive oil, sprinkle with kosher salt and squeeze the juice of one lemon over the top. Grill chicken and cut up. Slice zucchini in half. Drizzle with olive oil and sprinkle with salt. 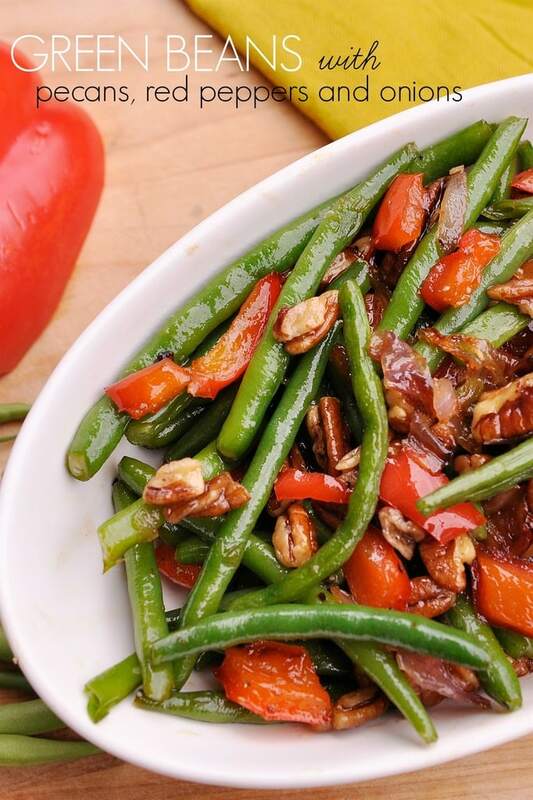 In a large frying pan add several tablespoons of olive oil and pine nuts. Stir until pine nuts begin to brown. Add garlic and stir. Add in roasted tomatoes, chicken, zucchini and fresh basil. Stir in cooked pasta. Salt and pepper to taste. Add in more olive oil if it seems dry. Sprinkle with Parmesan Cheese. 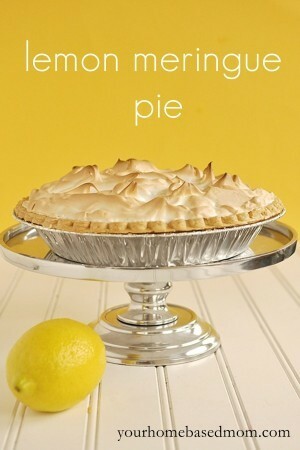 Will be making this for my daughter Friday night before her next cross country meet!! Sounds like a delicious way to get those carbs!!! 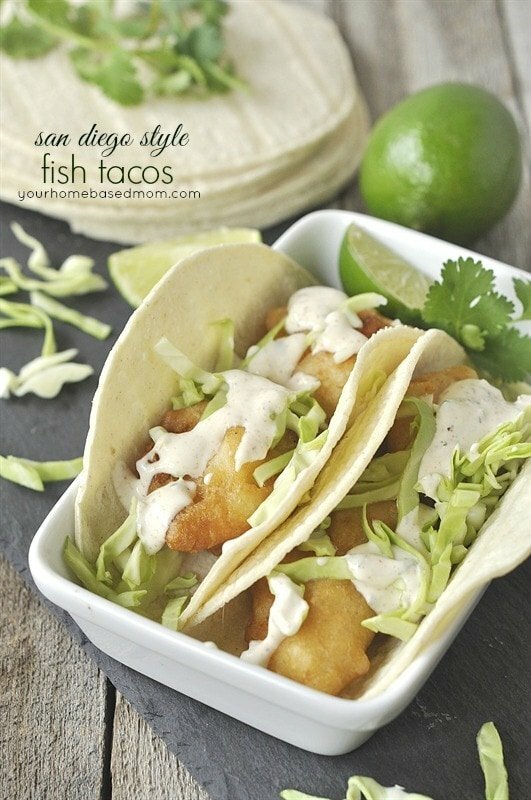 This recipe looks awesome and I am going to try it. I love the taste of basil, I’m Italian, but I cannot get the basil flavor in my cooked foods no matter how much I put in. Fresh or dried is the same. Someone told me to add the fresh basil at the end of cooking because cooking kills the flavor. 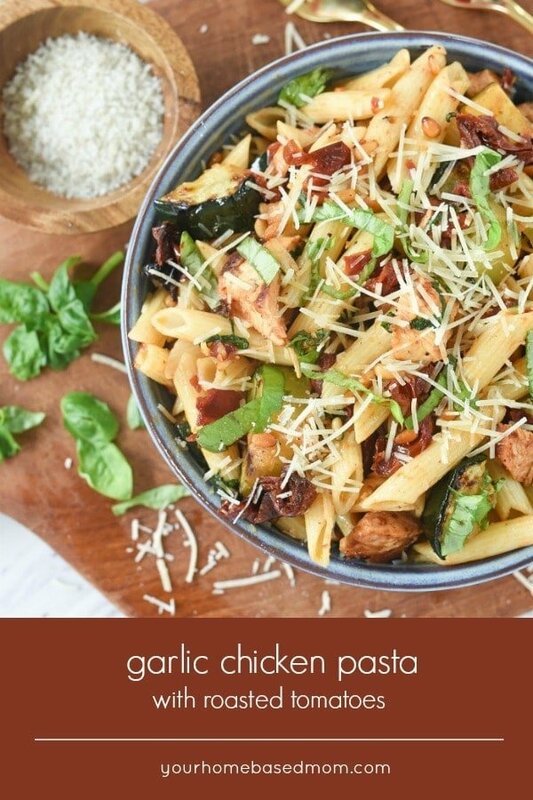 How can I get the nice distinct basil flavor in cook foods? THank you so much.